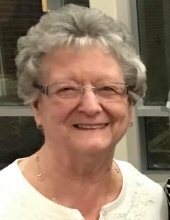 Wanda (Neff) Burkett, age 85 of Grinnell, died on Friday evening, April 12, 2019 at MercyOne Des Moines Medical Center. A funeral service will be held at 10:30 a.m. on Wednesday, April 17th at the Smith Funeral Home in Grinnell with Rev. John Epperson officiating. Interment at Hazelwood Cemetery in Grinnell. A reception will follow at the St. Francis Manor Social Center. Visitation will begin at 2:00 p.m. on Tuesday at the Smith Funeral Home and her family will receive family & friends from 4:00 p.m. until 7:00 p.m.
Memorials may be designated to the American Heart Association, mailed in care of the Smith Funeral Home, PO Box 368, Grinnell, Iowa 50112. Wanda Gayle Foster was born the daughter of Raymond and Edith (Chedester) Foster on October 13, 1933 in Grinnell, Iowa. She was raised in Grinnell and graduated from Grinnell High School with the class of 1952. Wanda was united in marriage to Robert L. Neff on June 27, 1952 in Grinnell. The couple made their home in Grinnell and were blessed with four children Duane, Richard, Diane and Debra. Wanda was a homemaker until she began working for the Grinnell school district as a cook, and then began an extensive career with Grinnell College in Dining Services until her retirement at the age of 75. Wanda was married to Doyle Burkett on November 1, 2006. Wanda was very proud of her family and loved attending her grandchildren’s school and sporting events. She was an excellent cook and was famous for her cinnamon rolls. She also enjoyed gardening and going to coffee with her friends while living at Seeland Park. She will be remembered for her kindness and compassion, for being a good friend, and for the love of her family. Wanda is survived by her sons, Duane (Janet) Neff of Grinnell and Richard Neff of St. Paul, Minnesota; daughter, Diane (Kevin) Schultz of Grinnell; step-sons, Rick (Gigi) Burkett of Waukee, Iowa and Neal Burkett of Grinnell; 8 grandchildren, Kerry Neff, Katie Offerman, Nicole Medin, Abby Neff, John Schultz, Amanda Bergman, Rachel Hall and Robert Frimml and 3 step-grandchildren;Alisha Burkett, Brooke Burkett and Bill Burkett; and 19 great grandchildren. Wanda was preceded in death by her parents; husband, Robert Neff; husband, Doyle Burkett; daughter, Debra McClure; and siblings, Lorene Barr and Gerald Foster. To send flowers or a remembrance gift to the family of Wanda Neff Burkett, please visit our Tribute Store. "Email Address" would like to share the life celebration of Wanda Neff Burkett. Click on the "link" to go to share a favorite memory or leave a condolence message for the family.